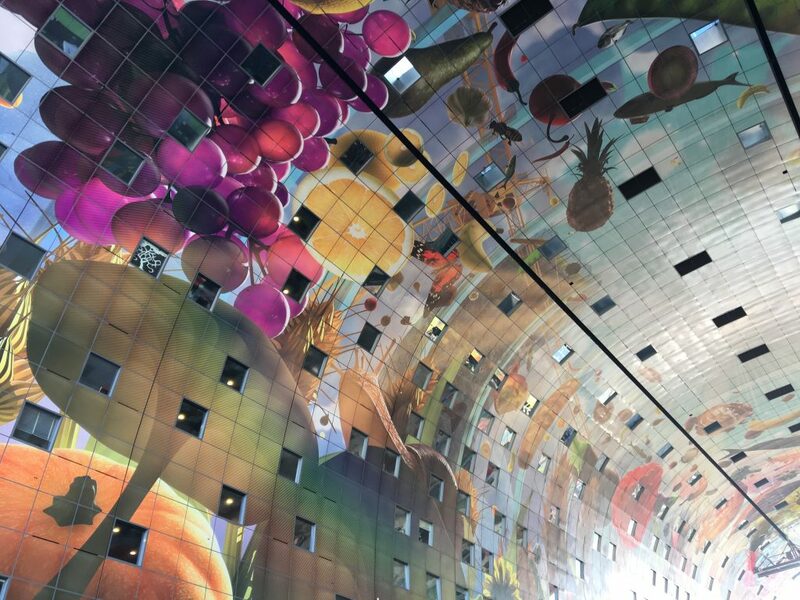 Arriving in Rotterdam. Can you spot Heather and her Brompton? 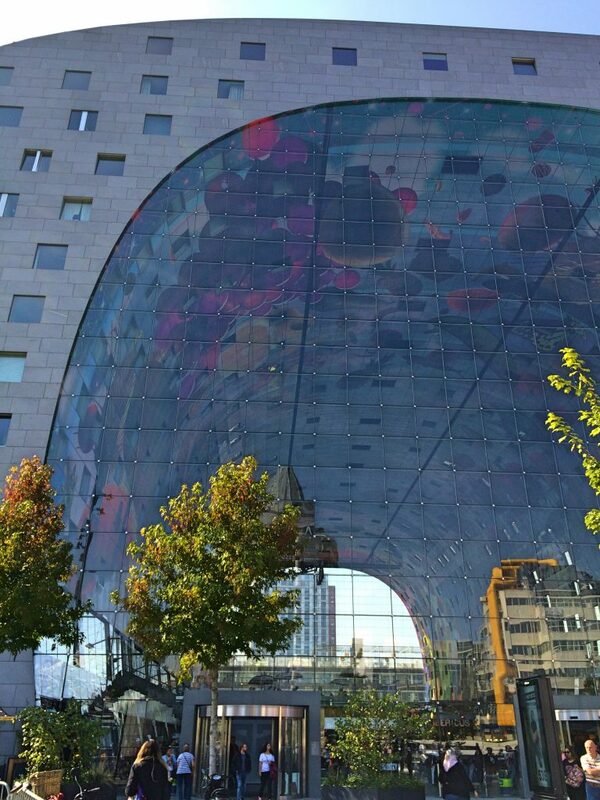 We fell in love with Rotterdam. 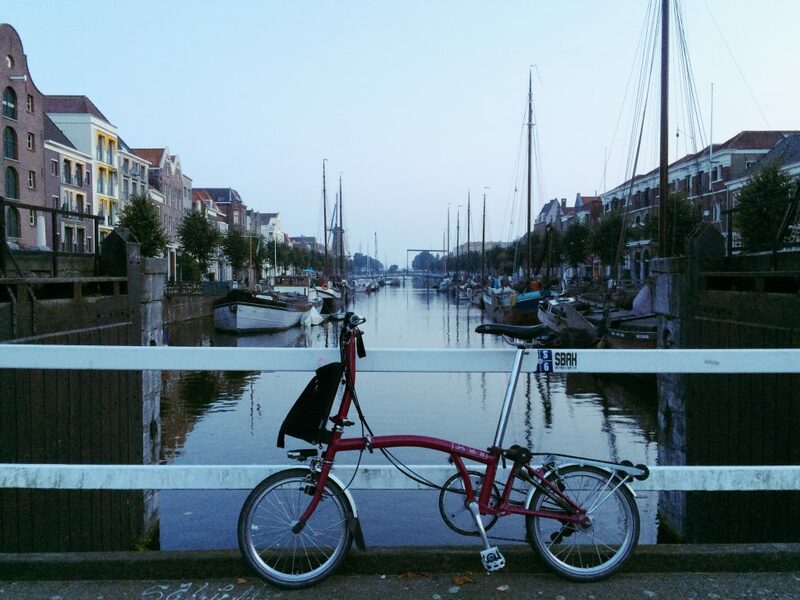 From the moment we emerged from the train station, Bromptons unfolded and ready to ride, Rotterdam impressed us with its easy-to-navigate grid pattern streets and excellent cycling infrastructure. There are bike lanes on every street! I wish I’d taken photos of ALL the awesome infrastructure, but I didn’t because I was too busy enjoying it. So, Google Street View to the rescue! 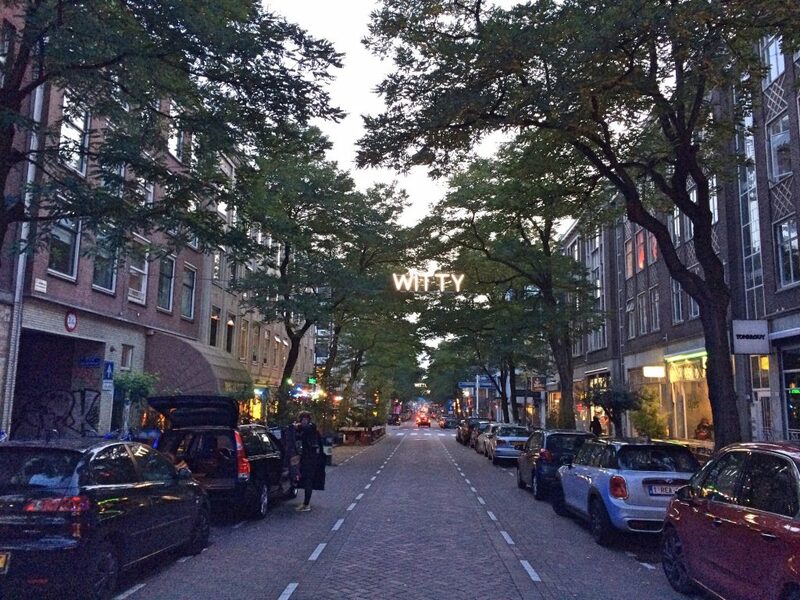 This is Westersingel, looking south from the train station. 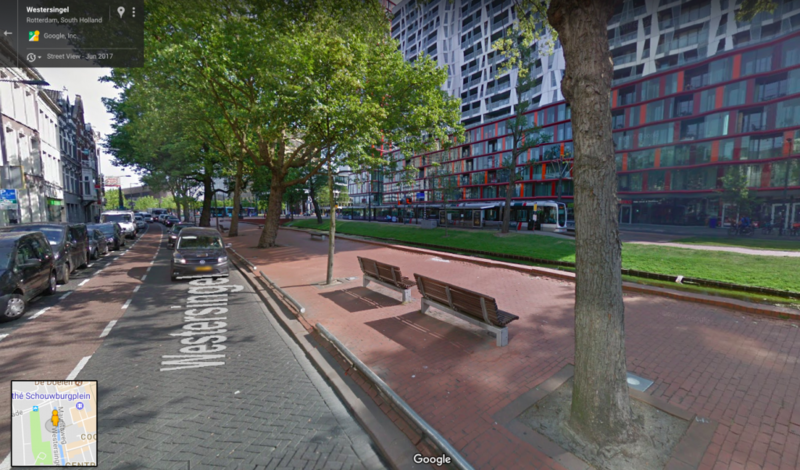 It’s a beautiful, wide street with trams and a pedestrian boulevard in the middle and cars and bikes and parking on the outside. The bike lanes are in red to make them more visible. 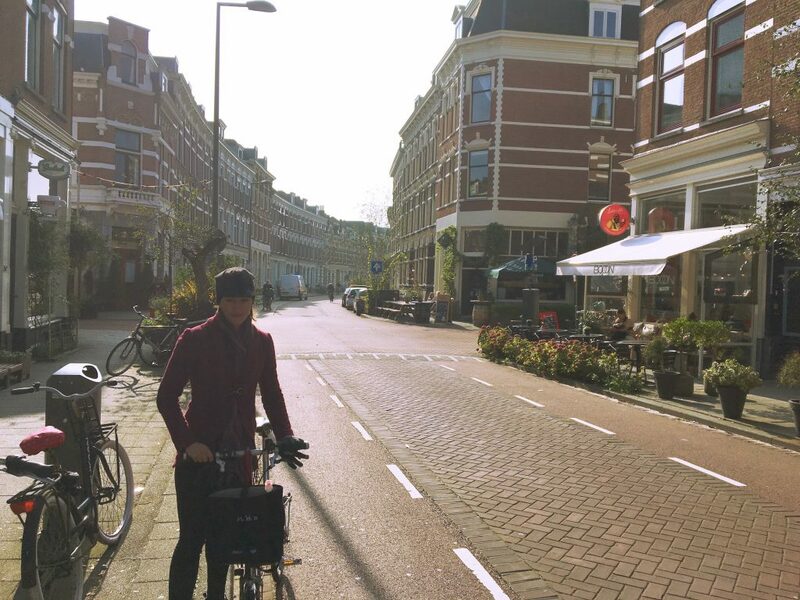 In North America I’d worry about biking along beside the parked cars and getting “doored”, but this is The Netherlands where everyone practices the “Dutch reach” (https://www.dutchreach.org/) and not once did anyone ever come close to dooring us. 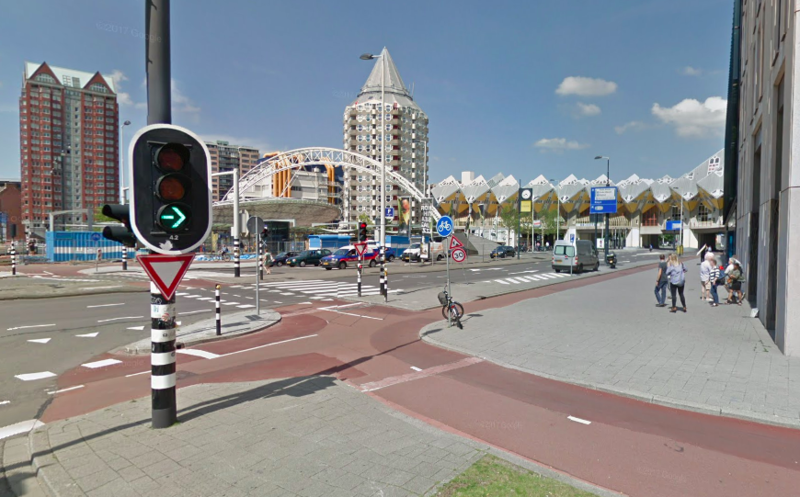 This is Westblaak, another big street with trams in the middle, then cars, then parking, and then bike lanes. But what makes this infrastructure extra great is that there are bi-directional bike lanes on BOTH SIDES of the street. So regardless of which side you’re on, north or south, you can cycle east and then reverse direction to go west without having to cross four lanes of car traffic plus tram tracks (unless you want to). This made me ridiculously happy. In Toronto we only have one bi-directional bike lane in the whole city! It runs along the south side of Queens Quay; there’s certainly not a second bi-directional bike lane on the north side. I wish! The middle lane is for cars, and the two smaller lanes on either side are for bicycles. 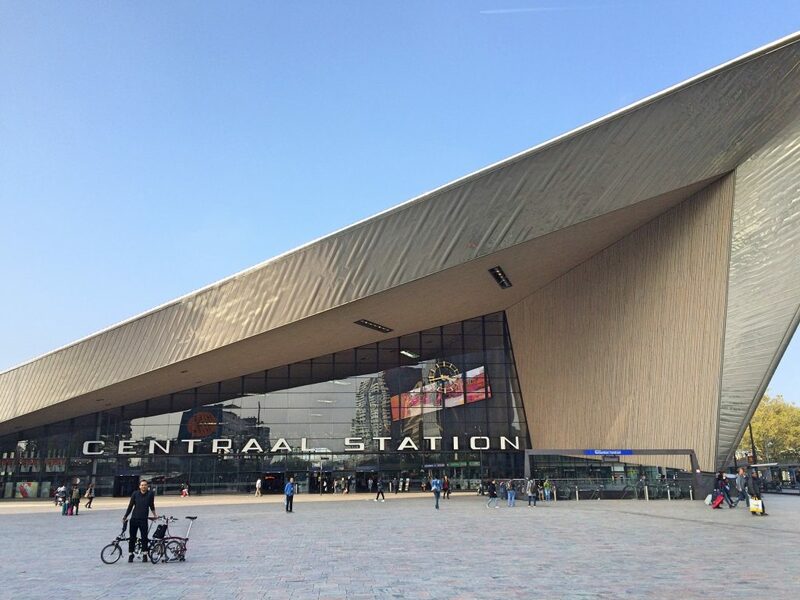 Bikes and trains go together like chocolate and peanut butter, so it’s no wonder that Rotterdam’s train station includes an underground bicycle parking garage. 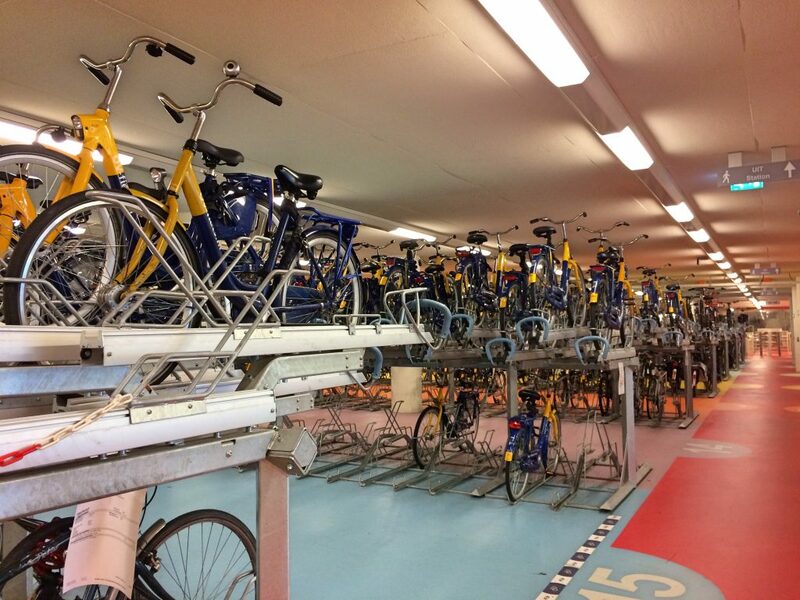 There are spaces for over 5000 bikes! You can park your bike for free, or for a small fee you can park in the guarded section. You can also rent bicycles here. 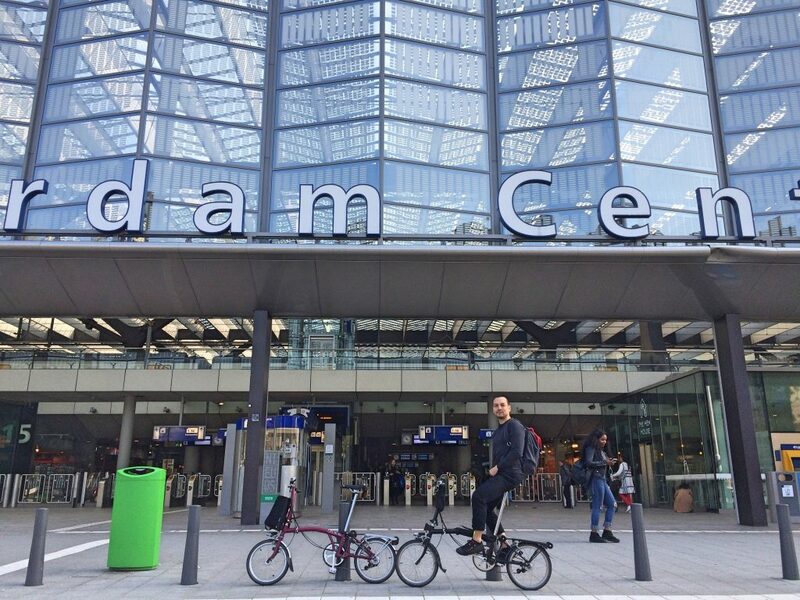 Rental bikes at the Rotterdam train station. On the west side of the train station, just behind the entrance to the underground bike parking, is a bicycle tunnel that cuts through to the other side of the station. 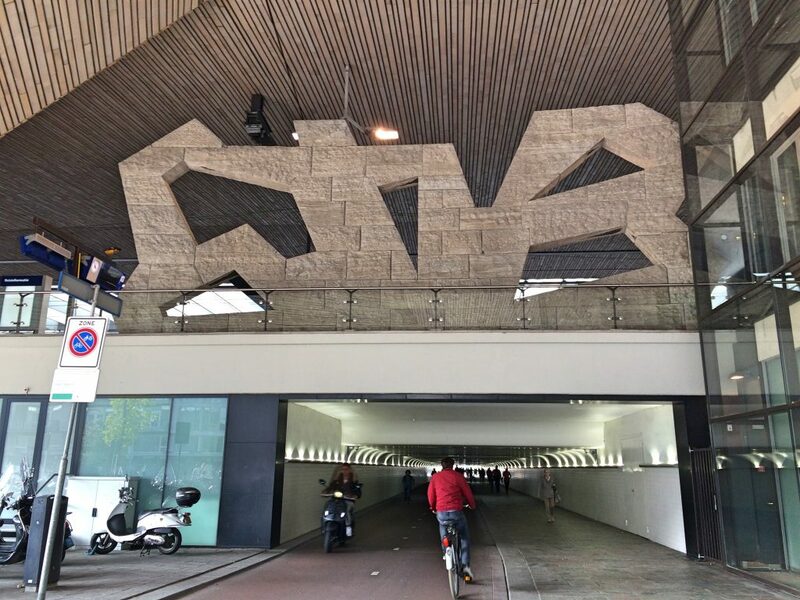 Rotterdam Centraal Station bicycle tunnel. 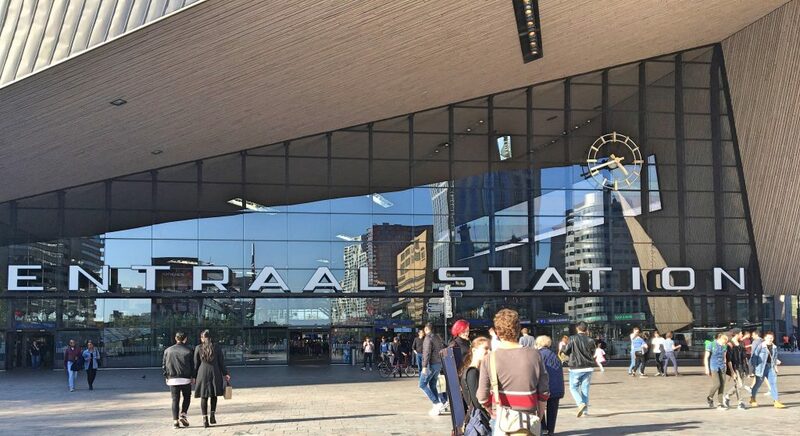 Rotterdam Centraal Station north entrance. And as you’ll see in the video, two-wheelers of all types use it! 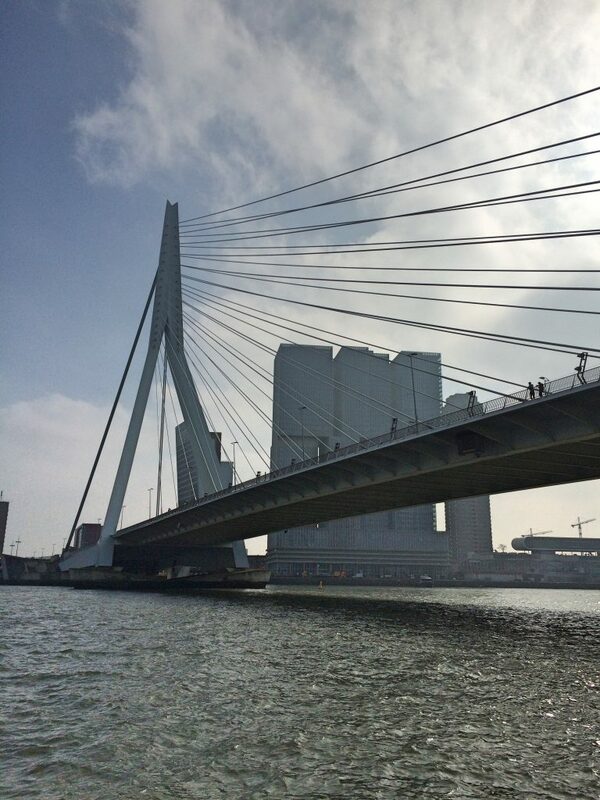 This was the last stop on our Netherlands tour, so we’d already seen a lot of bridges, but Rotterdam’s were memorable for their size, functionality and artistry. 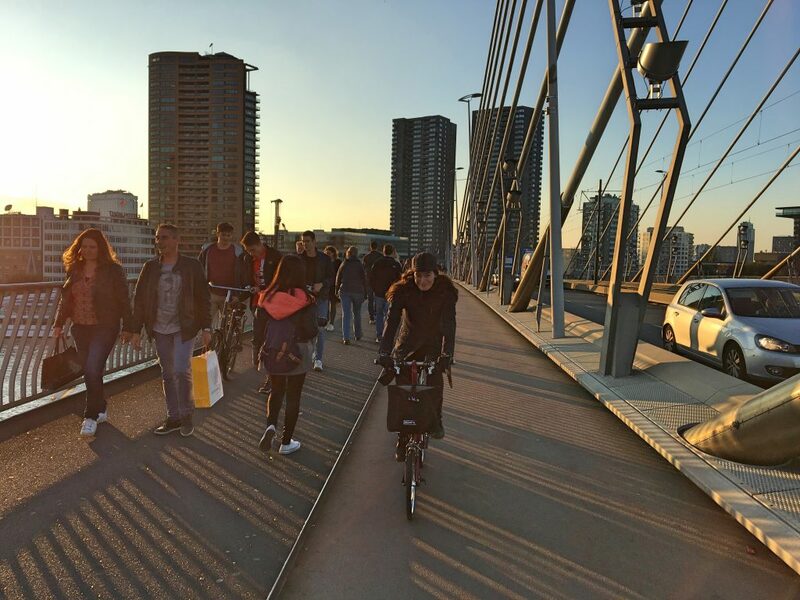 We cycled across the infamous Erasmusbrug our very first night in Rotterdam, and of course, it has fully separated bike lanes. 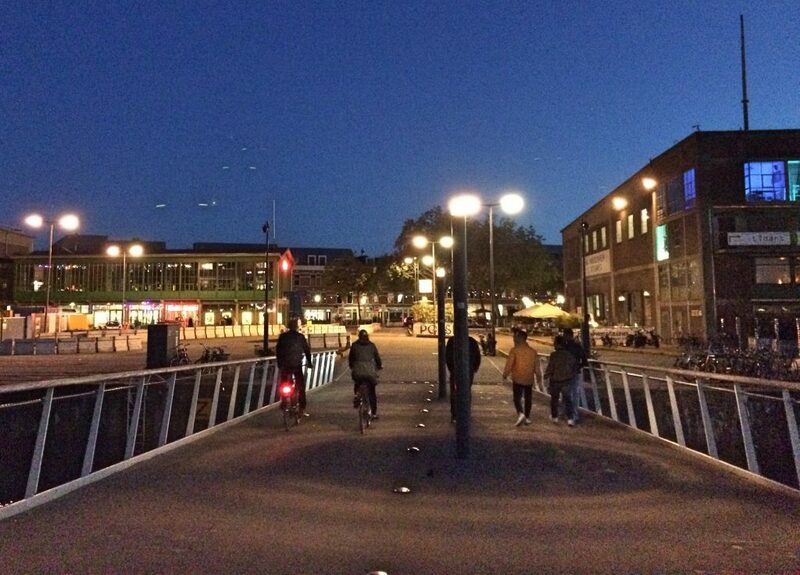 When we were there, it was Pride week and Erasmusbrug was lit up to celebrate! 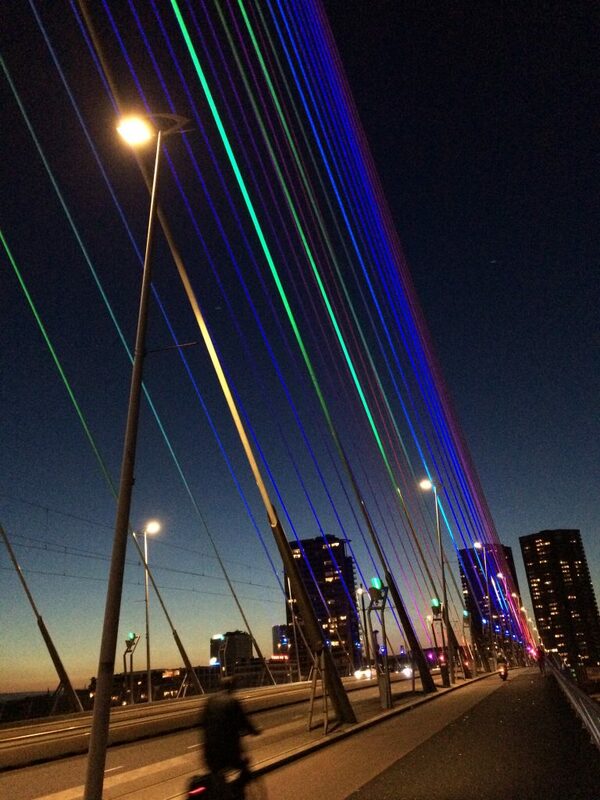 Erasmusbrug lit of up for Pride! 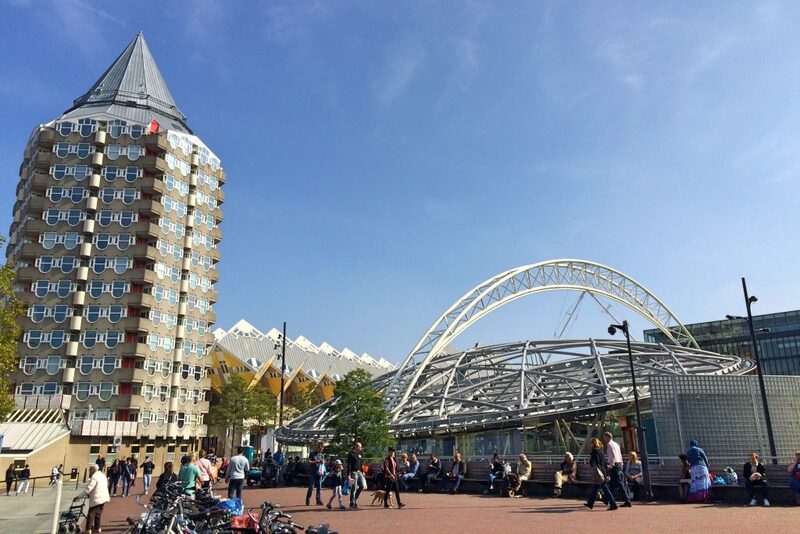 And if you want to visit the hip neighbourhood of Katendrecht, there is a handy shortcut leading to it from Whilamena Pier – the Rijnhavenbrug – for cyclists and pedestrians only! 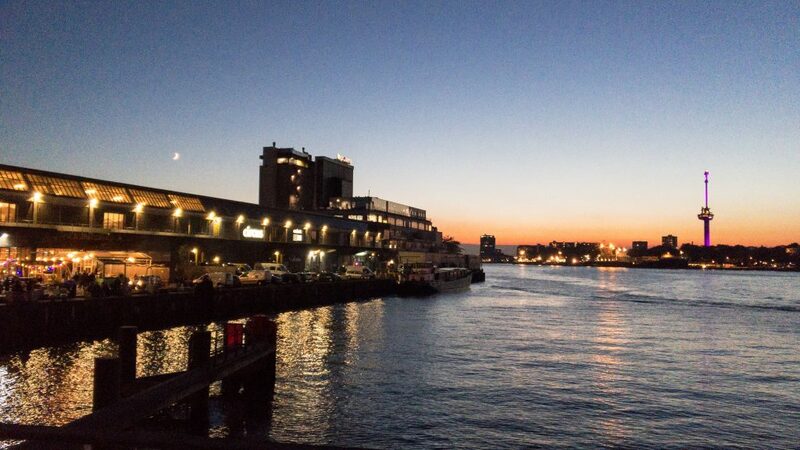 View from the Rijnhavenbrug – Fenix Food Factory and the Euromoast. 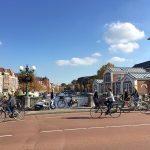 Of course, if you’re yearning for some quaint, old-fashioned canal bridges, Delfshaven is a quick 20 minute cycle from downtown Rotterdam. 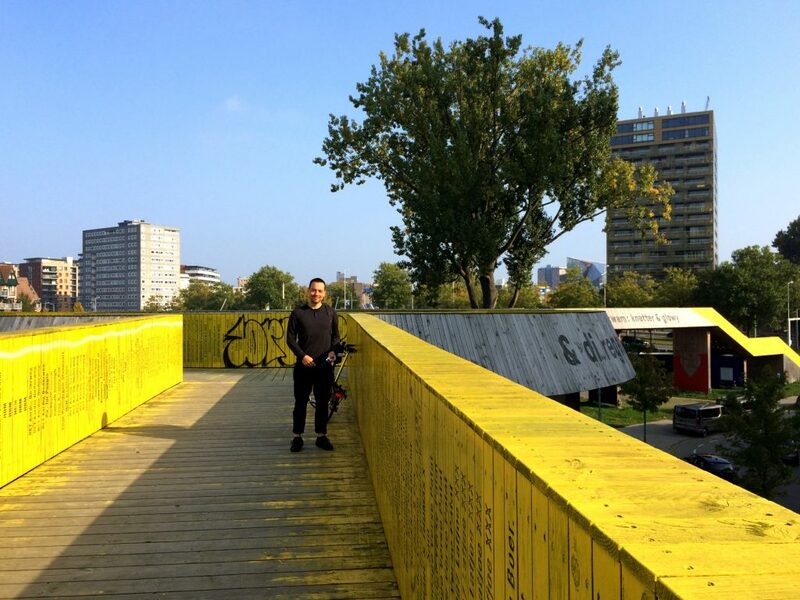 And one of the neatest bridges of all was this yellow wooden pedestrian bridge, the Luchtsingel, which means “air canal”. 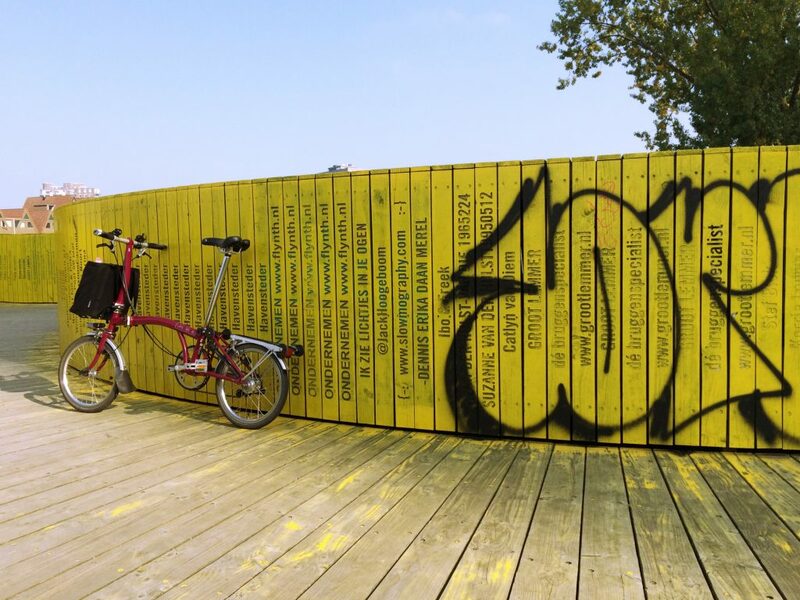 It was partially crowd-funded, and those who donated have their names on the wooden planks. 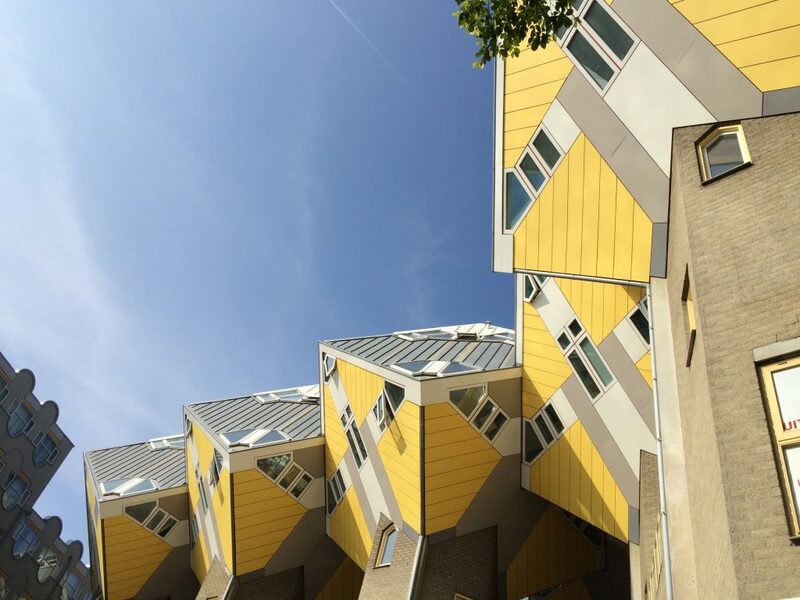 While cycling around on Rotterdam’s amazing infrastructure, don’t forget to enjoy the city’s stunning architecture and art! 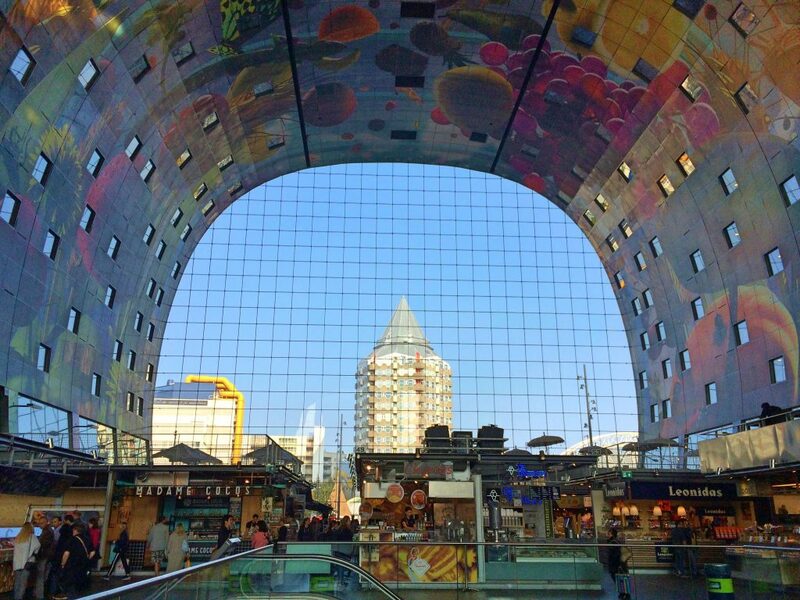 Inside the Markthal looking out to Blaak square. Proveniersstraat – rare old buildings in Rotterdam that were outside the downtown area that was bombed to oblivion in WWII. 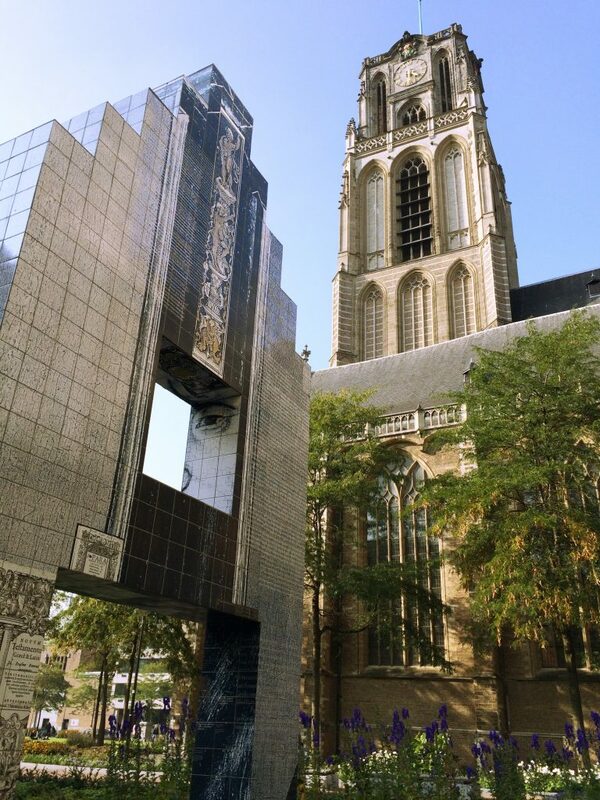 The Erasmus monument and Sint-Laurenskerk. The church was the only building that wasn’t destroyed in the WWII bombing. 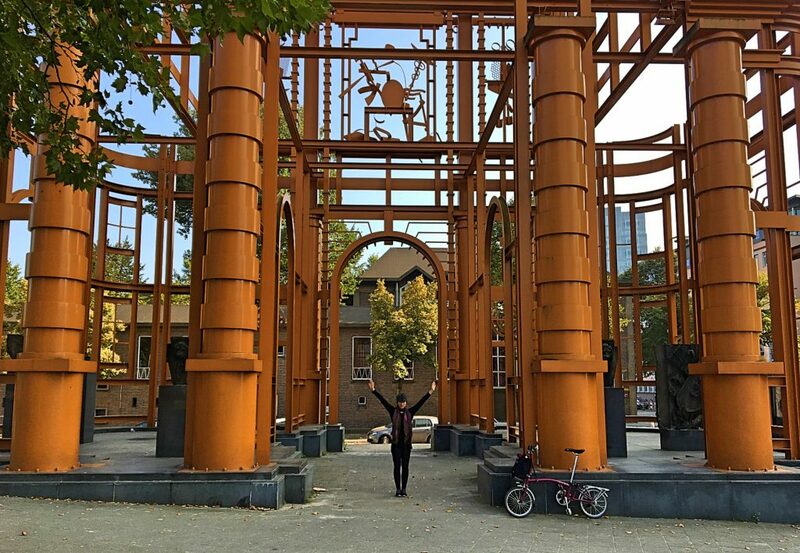 Sculpture Art of Rotterdam’s old gate. 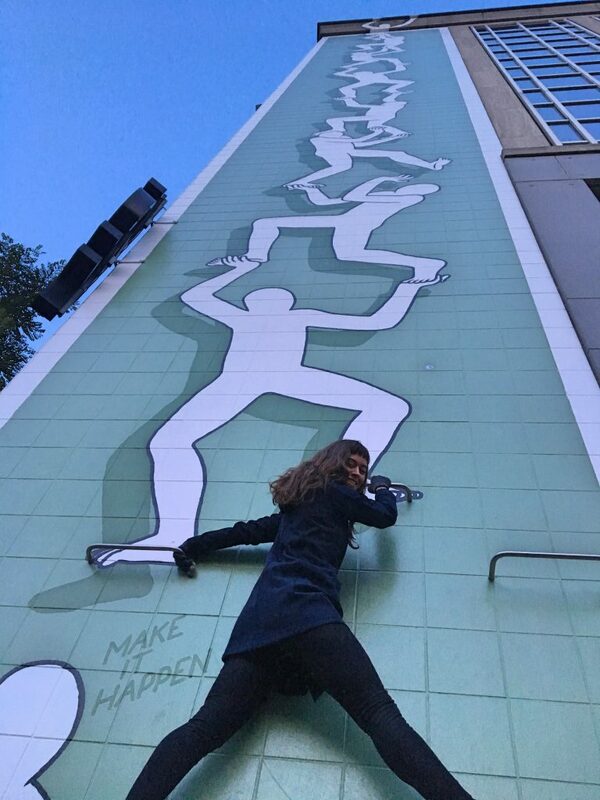 Interactive art! 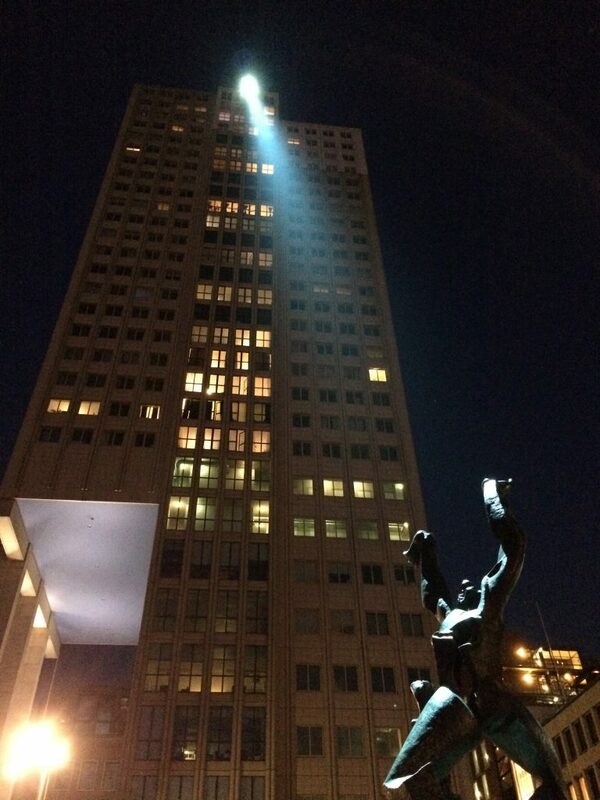 “Make It Happen” Rotterdam style. The Destroyed City sculpture war memorial. 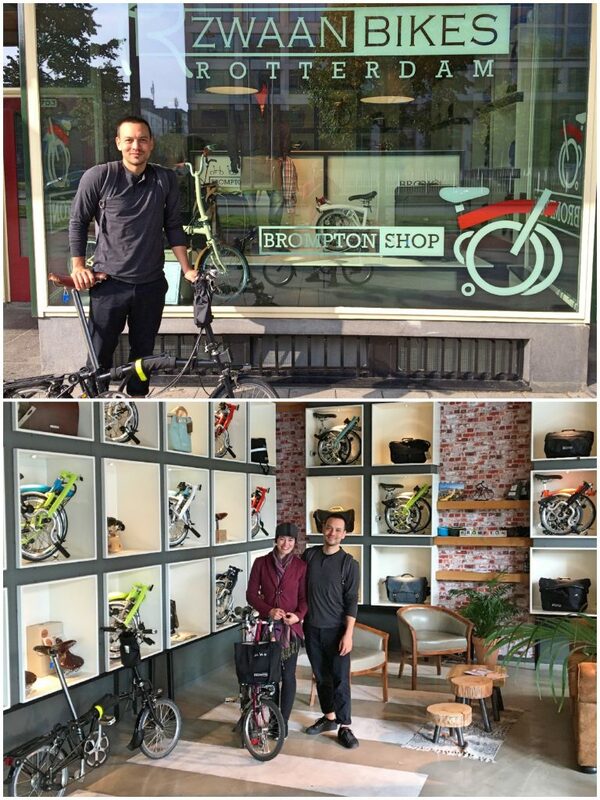 And last but certainly not least, we couldn’t leave Rotterdam without popping into the Brompton store! 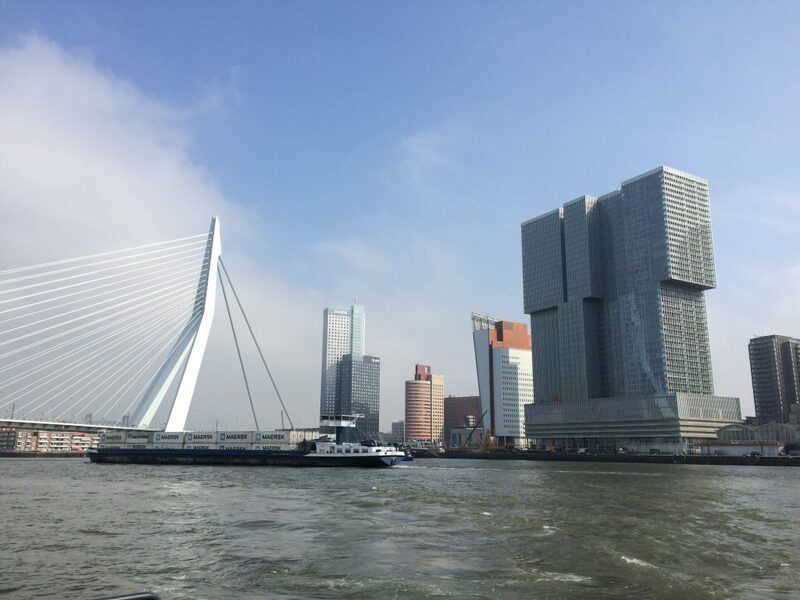 Everyone said we’d fall in love with Amsterdam, but we have to admit Rotterdam was the city that stole our hearts. Though perhaps Amsterdam didn’t have a fair chance. 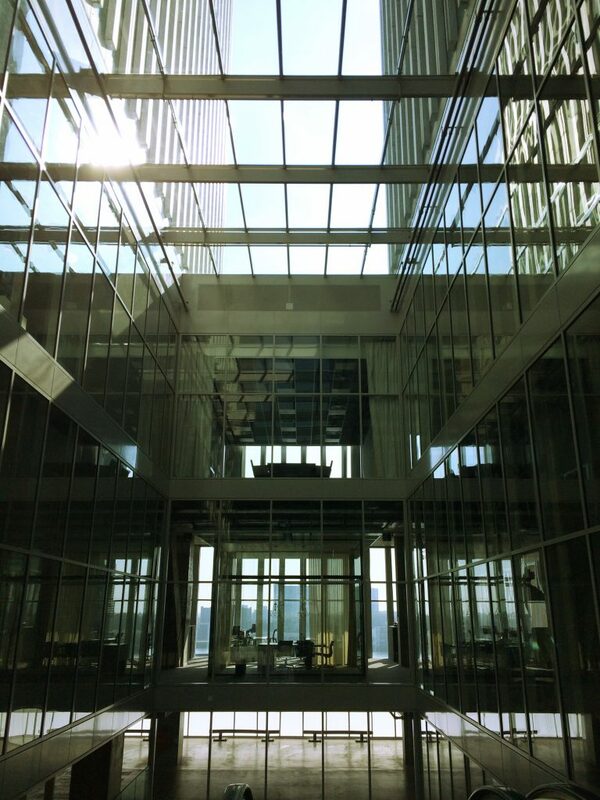 We were jet lagged our entire time there, and were staying outside the city centre in an AirBnB that turned out to be pretty grungy – two pretty big strikes against enjoying any place. In Rotterdam we stayed in the Easy Hotel, which was cheap, clean and conveniently located right downtown. 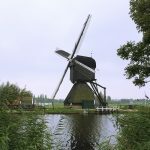 Up Next: We do a multimodal (bike + ferry) day trip from Rotterdam to Kinderdijk.